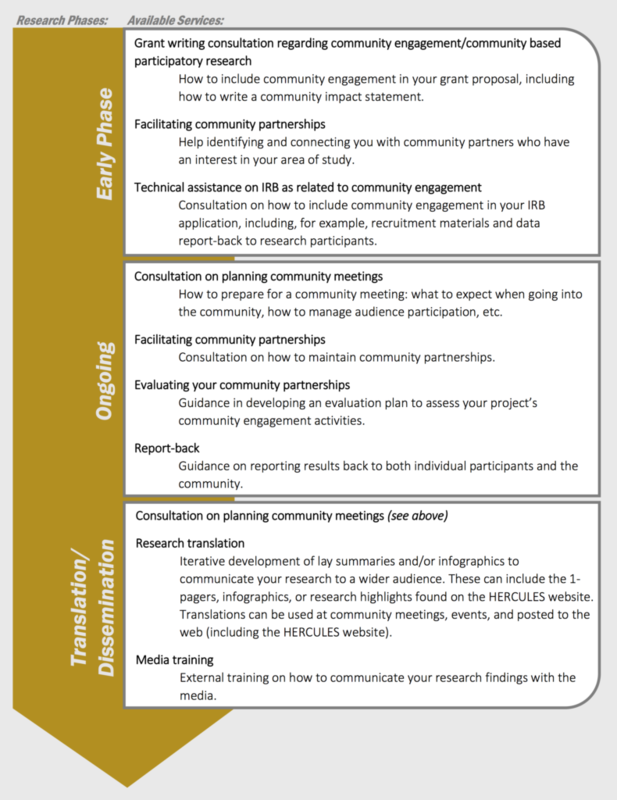 The HERCULES Community Engagement Core supports HERCULES Scientists’ efforts to engage with external partners at different phases of their research. Please refer to the list of available services below and use the request form at the bottom of the page to request any of the listed services. In addition to the services below, we invite all HERCULES Scientists to attend any of our quarterly Stakeholder Advisory Board meetings and meet our partners. If you do not see your desired service listed below, or if you have additional questions, please contact CEC Coordinator Erin Lebow-Skelley at elebows@emory.edu. CEC personnel are not allowed to directly participate in research activities, so CEC personnel may not engage in any activity that would require CEC personnel to be added to an IRB protocol. CEC services are intended to provide guidance and support for HERCULES scientists to include community engagement in their work and not to serve as extra staff time for projects. Additional resources for study design and assistance in IRB and human subjects related matters are available through the Clinical/Population Research Services. If you would like to also request consultation with this resource please make a note in your request and complete the Clinical/Population Research Services Request Form. CEC consultation services are provided based on the CEC personnel time needed, population served, and other pending requests. CEC personnel will dedicate 8 hours per month to providing CEC consultation services. Please indicate which Community Engagement Core services you are interested in and we will follow-up with you shortly to schedule an initial meeting. If you have any questions, please contact the CEC Coordinator, Erin Lebow-Skelley, at elebows@emory.edu. The HERCULES Community Engagement Core, with guidance from the Stakeholder Advisory Board and HERCULES scientists, creates infographics (visual summaries) and 1-page plain-language summaries of research conducted by HERCULES scientists that may be of interest to the greater Atlanta community. Visit our translations page here! The CEC also works with all Pilot Project grantees to develop brief summaries of their projects that are understandable by a wider audience. Read the Year 6 pilot project summary statements here.